Blake Austin Griffin (born March 16, 1989) is an American professional basketball player for the Los Angeles Clippers of the National Basketball Association (NBA). He played college basketball for the Oklahoma Sooners, when he was named the Consensus National Player of the Year as a sophomore. Griffin was selected first overall by the Clippers in the 2009 NBA draft, and has since been a five-time NBA All-Star and a four-time All-NBA selection. Griffin had a renowned high school career at Oklahoma Christian School, winning state titles each of his four years under his father, head coach Tommy Griffin. Griffin played two seasons of college ball for the Sooners before entering the 2009 NBA draft, when he was selected by the Clippers. During the final pre-season game of 2009, he broke his left kneecap, had surgery, and missed the entire 2009–10 season. Griffin made his NBA debut as a rookie the following season, in which he was selected as an All-Star, won the NBA Slam Dunk Contest, and was named the NBA Rookie of the Year. In 2011, Sports Illustrated called him one of the NBA's 15 Greatest Rookies of All Time. Griffin was born on March 16, 1989, in Oklahoma City, Oklahoma, to Tommy, who is of Afro-Haitian descent, and Gail Griffin, who is white. His father was a basketball center and track standout at Northwestern Oklahoma State University. Griffin and his older brother, Taylor Griffin, were home-schooled by their mother from first grade until Taylor was in the tenth grade and Blake was in eighth. Growing up, Griffin was good friends with Sam Bradford, the future NFL quarterback. Bradford's father owned a gym where Blake and Taylor played basketball. Before deciding to focus on basketball, Griffin also played baseball as a first baseman and football as a wide receiver, safety, and tight end. In 2003, Griffin followed his brother to Oklahoma Christian School, where they played under their father, head coach Tommy Griffin. They played together during the 2003–04 and 2004–05 high school seasons, winning two state basketball championships. In his freshman year, the Oklahoma Christian Saints posted a perfect 29–0 season and won the Class 3A boys state championship game at the State Fair Arena against Riverside Indian School, 55–50. In Griffin's sophomore year, the Saints repeated as Class 3A state champions, defeating Sequoyah-Tahlequah 51–34, where he scored 12 points and grabbed 9 rebounds. The team finished the season with a 24–2 record, with Griffin averaging 13.6 points per game. He was later named to the Little All-City All-State team in what was his final high school season with his brother. Taylor went on to accept a scholarship to play college basketball for the Oklahoma Sooners. During the summer of 2005, Blake was a member of the Athletes First AAU team, where he played against Kevin Durant and Ty Lawson's AAU team, the DC Blue Devils. During Griffin's junior season, the Oklahoma Christian basketball team was moved down to Class 2A from Class 3A. As he began his third season with the Saints, he was quickly developing as a player, as he led them to a third straight state championship. He scored 22 points, grabbed 9 rebounds, and recorded 6 blocks in the finals as Oklahoma Christian defeated Washington High School, 57–40. He was named the state tournament MVP, and the Saints finished the season 27–1, with Griffin averaging 21.7 points, 12.5 rebounds, and 4.9 assists. For his efforts, he was named The Oklahoman Player of the Year and to the Tulsa World Boys All-State First Team. His play attracted the attention of the new basketball head coach for Oklahoma, Jeff Capel, who first heard of him through his brother, Taylor. That spring, Capel saw him play for the first time and was quickly impressed. Capel liked the fact that Griffin had not yet become a household name among recruiters and felt he was exactly the player he needed to rebuild the Oklahoma men's basketball program with. Griffin had been considering Duke, Kansas, North Carolina and Texas, but his brother eventually sold him on joining Oklahoma when he raved about the direction of the Sooners and the chance to play together again for his home state. Griffin committed to Oklahoma before the start of his senior season. He went on to average 26.8 points, 15.1 rebounds, 4.9 assists and 2.9 blocks per game as a senior while leading the team to a 26–3 record. In a game against Oklahoma City Southeast, he finished with 41 points, 28 rebounds, and 10 assists. The Saints advanced through the playoffs, defeating Crescent in the quarterfinals and Foyil in the semifinals to earn a berth in the Class 2A state championship once again. On March 10, 2007, he played his final high school game in the state title game against Pawnee High School. Griffin registered 22 points, 9 rebounds, 6 assists and 2 blocks, as the Saints defeated Pawnee 81–50, winning their fourth straight state title. He was named the Class 2A state tournament MVP for the second consecutive year after averaging 26.6 points per game in the tournament. During his four-year run, the Oklahoma Christian Saints posted a 106–6 overall record. Following Griffin's senior year, he was named the Player of the Year by both the Tulsa World and The Oklahoman. He was also named to the Oklahoma Boys All-State First Team, EA Sports All-American Second Team and Parade All-American Third Team. Additionally, he was the Gatorade Oklahoma Player of the Year and was selected to the McDonald's All-American and Jordan Brand All-America teams. At the McDonald's All-American game in Louisville, Kentucky, he won the Powerade Jam Fest slam dunk contest. He was ranked as the nation's 13th best high school senior by HoopScoop, 20th by scout.com and 23rd by rivals.com. HoopScoop also rated him as the country's third-best power forward while Rivals.com ranked him sixth and was seventh according to Scout.com. Griffin was one of the highest rated and most decorated recruits ever at Oklahoma. As a freshman at Oklahoma, he averaged 14.7 points and 9.1 rebounds and led the Sooners to a 23–12 record. He ranked ninth in scoring, fourth in rebounding and third in field goal percentage in the Big 12 Conference. In a game against the Kansas Jayhawks, he suffered a sprained medial collateral ligament (MCL) in his left knee five minutes into the game. Less than two months after injuring his left knee, he injured his right knee in a home victory against Texas A&M. The injury this time was torn cartilage, and he had arthroscopic surgery on March 2, 2008. He missed the following game, a victory over in-state rival Oklahoma State Cowboys, but was back on the court a week after the injury with 14 points and 8 rebounds in a win versus Missouri. Griffin was a first-team all-district pick by the USBWA and NABC, and was named to the Big 12 All-Rookie Team and to the first-team All-Big 12 selection by league coaches and Associated Press. He became the first Sooner to make the conference All-Rookie team since Wayman Tisdale in 1983 for the Big Eight Conference. He was expected to be a lottery pick in the 2008 NBA draft but decided to return to college to give himself time to mature physically and to try to help Oklahoma win the NCAA championship. In Griffin's sophomore season, the Sooners started out the season winning their first 12 games before falling to the Arkansas Razorbacks. In the third game of the season, in a win against the Davidson Wildcats, he scored 25 points and grabbed 21 rebounds. The very next game, he had 35 points and 21 rebounds against Gardner–Webb, becoming the first player in Big 12 history to record back-to-back games of at least 20 points and 20 rebounds. This earned him three consecutive Big 12 player of the week honors and finished the season with a record-tying six player of the week honors. In a home victory against the Texas Tech Red Raiders, he set career bests for both points and rebounds with 40 points and 23 rebounds, becoming the only player in Big 12 history and the third player in the history of the University of Oklahoma men's basketball program to record at least 40 points and 20 rebounds in a game, joining Wayman Tisdale (61 points and 22 rebounds in 1983) and Alvan Adams (43 points and 25 rebounds in 1975). On February 21, Griffin received a concussion in a loss to the Texas Longhorns, when he caught an inadvertent shot to the face from the open hand of Texas center Dexter Pittman. He sat out the second half during the Sooners loss with a bloody nose. It was the Sooners' first loss of their conference schedule for the season. After sitting out the next game, a loss to Kansas Jayhawks, he was cleared by the medical staff and returned a week later to get 20 points and 19 rebounds in a victory over Texas Tech. Oklahoma finished second in the conference with a 13–3 record but fell short in the first game of the Big 12 Tournament to Oklahoma State. In the NCAA tournament, Oklahoma was seeded No. 2 in the South Region with a 27–5 record. In a second-round win over the Michigan Wolverines, Griffin scored 33 points and grabbed 17 rebounds and became just the second player in the 2000s (decade) with at least 30 points and 15 rebounds in an NCAA tournament game. The Sooners ended up losing to the North Carolina Tar Heels in the South Regional final. Griffin averaged 22.7 points, 14.4 rebounds and 2.3 assists per game during the regular season and earned All-American First Team honors. He led the NCAA in rebounding and was also the Big 12 scoring and rebounding leader. Griffin recorded at least 20 points and 15 rebounds 15 times, which is a Big 12 record. He also set school and Big 12 single-season records for most rebounds (504), rebounding average (14.4), and double-doubles (30), and his free throw attempts (324) were the most by a Sooner in a single-season. With 30 double-doubles during the season, he was one short of the NCAA record of 31 set by David Robinson in 1986–1987. His total of 504 rebounds were the most in a season by an NCAA Division I player since Indiana State's Larry Bird had 505 in 1978–79 and his rebounding average of 14.4 was the highest since Wake Forest's Tim Duncan averaged 14.7 in 1996–97. For his sophomore year performance, Griffin swept all six of the national player of the year awards. He was a unanimous choice by voters in all nine geographical districts for the Oscar Robertson Trophy and was named Associated Press College Basketball Player of the Year, receiving 66 of the 71 national media panel members' votes. Griffin was announced as the Naismith College Player of the Year on April 5 in Detroit. Three days after announcing that he would turn pro, he won the John Wooden Award as college basketball's top player. He became the first Oklahoma player in school history to win the Naismith Award, Oscar Robertson Trophy, Adolph Rupp Trophy, John Wooden Award and the Associated Press player of the year. He was also named Player of the Year by the Big 12, Sports Illustrated, The Sporting News and FoxSports.com. On April 7, 2009, Griffin announced that he would give up his final two years of eligibility and declared for the NBA draft after his sophomore year. A press conference announcing his decision was aired nationally on ESPNews. He was selected as the first overall pick by the Los Angeles Clippers in the 2009 NBA draft. Griffin played for the Clippers' Summer League Team and was named Summer League MVP. In their final preseason game, he injured his kneecap as he landed after a dunk. The day before the 2009–10 season started, it was confirmed that Griffin had a stress fracture in his left knee, delaying his NBA debut for seven weeks. After resting the stress fracture for several weeks, tests revealed that his knee was not recovering properly. In January 2010, Griffin had surgery on his broken left kneecap causing him to miss the remainder of the 2009–10 season. Since he missed the entire 2009–10 season, Griffin was still considered a rookie during the 2010–11 season. In his NBA debut, against the Portland Trail Blazers, Griffin registered 20 points and 14 rebounds. He set a franchise record for most consecutive double-doubles with 23 in a home game against the Golden State Warriors. His streak of consecutive double-doubles, which ended at 27 games on January 19 in a win against the Minnesota Timberwolves, was the longest rookie double-double streak since 1968. On November 11, 2010, Griffin scored a then career-high 44 points against the New York Knicks and on January 17, 2011 against the Indiana Pacers, he scored a new career-high 47 points and set a Clippers franchise record for most points by a rookie. He became the first rookie to have two 40+ point games in his rookie season since Allen Iverson during the 1996–97 season. Griffin was voted to the 2011 NBA All-Star Game by coaches as a reserve on the Western Conference squad, becoming the first rookie to play in the All-Star game since Yao Ming in 2003 and the first rookie voted to the game by coaches since Tim Duncan in 1998. He also participated in the 2011 Rookie Challenge and won the Sprite Slam Dunk Contest during the All-Star break. On March 23, 2011, in a double overtime win over the Washington Wizards, Griffin recorded his first career triple-double with 33 points, 17 rebounds, and 10 assists. He recorded his second triple-double with 31 points, 10 rebounds, and 10 assists in the final game of the season against the Memphis Grizzlies. During the season, Griffin captured all six of the Western Conference Rookie of the Month honors, the first time a rookie has swept an entire season of Rookie of the Month awards since Chris Paul during the 2005–06 season. He played in all 82 regular season games and became the first rookie to average at least 20 points and 10 rebounds since Elton Brand did it in the 1999–2000 season. He led all rookies in points, rebounds, and double-doubles, earning him the Rookie of the Year award, and was the first unanimous winner for the award since David Robinson in 1990. He was also the only unanimous selection to the NBA All-Rookie First Team. Following his phenomenal rookie season, Sports Illustrated listed Griffin as one of the "NBA's 15 Greatest Rookies of All Time". Griffin was voted to play as a starter for the first time in the 2012 NBA All-Star Game along with new teammate Chris Paul. He was also selected to participate in the inaugural Rising Stars Challenge in which teams were a mix of the top rookies and sophomores. Griffin was selected first by Team Shaq. Griffin averaged another double-double on the lockout-shortened season with 20.7 ppg and 10.9 rpg. He and teammate Chris Paul helped lead the Los Angeles Clippers to a 40-26 record and made the playoffs for the first time since 2006. In the first round of the 2012 NBA Playoffs, Griffin helped the Clippers eliminate the Memphis Grizzlies in seven games. However, the Los Angeles Clippers were quickly swept by the San Antonio Spurs in the next round. Afterwards, Griffin was named to the All-NBA Second Team for the first time in his career. Before the 2012–13 NBA season, on July 10, 2012, Griffin signed a contract extension reportedly worth $95 million for 5 years. The deal will keep him under contract until the end of the 2017–18 season. He was also selected to compete for Team USA in the 2012 London Summer Olympics, but was removed after he injured his knee during a practice. Griffin was again voted by the fans as a starter for the 2013 NBA All-Star Game. On March 6, 2013, Griffin recorded his third career triple-double by scoring 23 points, grabbing 11 rebounds, and dishing out 11 assists to lead the Los Angeles Clippers to victory over the Milwaukee Bucks. Griffin finished the season averaging 18.0 ppg and 8.3 rpg in 32.5 mpg. He and Chris Paul led the Los Angeles Clippers to a 56-26 record as the Clippers won their first Pacific Division title in franchise history. The Clippers went on to lose to the Memphis Grizzlies in six games in the first round. Griffin was named to the All-NBA Second Team once again. After a disappointing first round exit in the playoffs, the Los Angeles Clippers sought new leadership and hired head coach Doc Rivers. In his first season with Rivers at the helm, Griffin averaged a career-high 24.1 points per game. He was voted as a starter in the NBA All-Star Game, making it his fourth consecutive All-Star appearance and third consecutive start. From January 20 to March 26, Griffin recorded 20+ points in a franchise-record 31 straight games. On April 2, 2014, Griffin and Chris Paul led the Los Angeles Clippers to a 112-108 win over the Phoenix Suns to clinch their second franchise division title. The next day, Griffin recorded his fourth career triple-double with 25 points, 10 rebounds and 11 assists in a 107-113 loss to the Dallas Mavericks. The Los Angeles Clippers finished with a franchise-best record of 57-25 and earned the third seed in the Western Conference playoffs. They would be matched up with the Golden State Warriors in the first round. On April 21, 2014, Griffin scored a playoff career-high 35 points in a win over Golden State. The Clippers would eventually beat the Warriors in 7 games in the midst of the Donald Sterling controversy. They would then lose to the Oklahoma City Thunder in the conference semi-finals. Griffin was named to the All-NBA Second Team for the third straight year, whilst also finishing the season third in the MVP voting. After the controversial remarks from former Clippers owner Donald Sterling, NBA commissioner Adam Silver banned Sterling from the league for life and forced him to sell the Clippers. Former Microsoft CEO Steve Ballmer later bought the Clippers for $2 billion, the largest amount paid for a franchise in NBA history. On December 8, 2014, Griffin scored a season-high 45 points on 14-of-24 shooting, including a game-winning three-pointer as time expired, as the Clippers beat the Phoenix Suns in one overtime, 121-120. This was Griffin's first career game-winning buzzer beater. It gave the Clippers their eighth straight win. On February 8, 2015, he was ruled out for four to six weeks due to a staph infection in his right elbow. He returned to action on March 15 after missing 15 games to record 11 points and 11 rebounds in a 100-98 loss to the Houston Rockets. Griffin finished the regular season averaging 21.9 points, a career-low 7.6 rebounds, and a career-high 5.3 assists in 67 games. On April 22, Griffin recorded his first career playoff triple-double with 29 points, 12 rebounds and 11 assists in a first round game 2 series loss to the San Antonio Spurs. Four days later in Game 4, Griffin recorded a playoff career-high 19 rebounds and with 20 points helped the Clippers even the series at 2-2. In the series' Game 7 victory on May 2 that moved the Clippers into the second round, Griffin recorded his second career playoff triple-double with 24 points, 13 rebounds, and 10 assists. Two days later in Game 1 of the Clippers' semi-final match-up against the Houston Rockets, Griffin recorded 26 points, 14 rebounds and 13 assists for his second straight triple-double to lift the Clippers to a 117-101 victory. The Clippers ended up losing the series to the Rockets in seven games. On November 25, 2015, Griffin recorded season highs with 40 points and 12 rebounds in a loss to the Utah Jazz, with the Clippers dropping to 7–8 after starting the season 4–0. On December 26, he was ruled out indefinitely with a partially torn left quadriceps. While expected to return to action on January 26, Griffin was instead ruled out for an estimated four to six weeks due to a right hand injury he sustained on January 23 from hitting a member of the team's equipment staff, who was also his friend, during an argument at a restaurant in Toronto. The Clippers were sternly critical of Griffin, and indicated that further punitive action would follow. According to the Toronto Police Service, a police report was not filed. Griffin missed 45 games in total due to injury and suspension, returning to action for the Clippers on April 3 against the Washington Wizards. He played 24 minutes as a starter and recorded six points and five rebounds to help the Clippers clinch home-court advantage in the playoffs with a 114–109 win. He appeared in five of the Clippers' final seven games of the regular season, and managed to appear in the first four first-round playoff games against the Portland Trail Blazers before aggravating the left quad injury in Game 4, which ruled him out for the rest of the postseason. On November 5, 2016, Griffin scored a season-high 28 points in a 116–92 win over the San Antonio Spurs, helping the Clippers start the season 5–1. He helped them improve to a league-best 7–1 with 22 points and 13 rebounds against the Portland Trail Blazers on November 9. With his fifth rebound of the night, Griffin reached 4,000 in 417 career games, the second-fastest player since 1983–84 to reach 8,500 points, 4,000 rebounds and 1,500 assists; Chris Webber did so in 408 games. On November 11, he helped the Clippers improve to a franchise-best 8–1 with 25 points against the Oklahoma City Thunder. The following day, in a win over the Minnesota Timberwolves, Griffin joined an exclusive club with 9,000 career points, 4,000 rebounds and 1,500 assists. He became the fastest player to reach that plateau since Larry Bird. Standing at 6 feet 10 inches (2.08 m) and weighing 251 lb (114 kg), Griffin plays mostly as a power forward. In his rookie year, he averaged 22.5 points, 12.1 rebounds, and 3.8 assists per game, becoming just the 20th rookie in NBA history to average at least 20 points and 10 rebounds a game in the shot clock era. He is an exceptional athlete which results in numerous highlight dunks. Rob Mahoney, in a January 2011 post in the New York Times basketball blog, singled out Griffin's playmaking abilities stating, "The overtly dominant aspects of Griffin's play have made him one of the season's greatest delights, but his game clearly stretches beyond the scoring and rebounding columns...his passing aptitude should serve as a reminder of the substance in his game. The dunks are great, but it's his multiple-layered impact that has paved his early road to stardom." Griffin resides in Pacific Palisades, California. He has a son named Ford Wilson Cameron-Griffin with Brynn Cameron, who is the sister to NFL Tight end Jordan Cameron. In 2011, Panini America signed Griffin to an exclusive long-term deal that will feature his autographs and memorabilia in their products. Griffin was on the cover of NCAA Basketball 10 and was also on the cover of NBA 2K13 alongside fellow NBA stars Kevin Durant and Derrick Rose. He has appeared regularly in commercials for Kia Motors, Subway, Vizio, and GameFly. Griffin is a Christian. He spoke of his faith in relation to his rookie season injuries saying, "I was just excited about the opportunity to play in the NBA. I was ready to go but everything came crashing down, so to speak, but these things happen. It was frustrating, but at the same time, I know everything happens for a reason. I don't know what that reason is, only God knows. I just have to wait and let His plan unveil." Griffin was charged with misdemeanor battery as a result of an October 2014 Las Vegas encounter. He allegedly seized a cell phone from its owner, grabbed the owner's neck twice and slapped him, after the owner took a picture of a group of Clippers players. The charges were dismissed in March 2015 for lack of evidence. In January 2016, Griffin injured his hand in a fight with the team's equipment manager at a Toronto restaurant, with whom he has been close friends for years. The injury was a spiral fracture, which ruled him out four to six weeks. Griffin started a fundraiser called "Dunking for Dollars", in which he donates $100 to fight childhood obesity for every dunk he makes during the season. The Kia sedan that Griffin jumped over to win the Slam Dunk Contest was donated for a charity auction on AutoTrader.com with proceeds benefiting Stand Up to Cancer. Stand Up to Cancer also has a fund-raising site called "Team Blake" in honor of Griffin's close friend Wilson Holloway, who died after a three-year fight with Hodgkin's lymphoma. 1 2 NBA's Greatest Rookies Of All Time. sportsillustrated.com. Retrieved September 17, 2011. ↑ "Blake Griffin: no longer a rookie". Retrieved 13 March 2014. ↑ "One drop rule:A guide to black celebrities". Retrieved 13 March 2014. 1 2 3 4 5 6 7 8 9 10 11 12 13 Blake Griffin – SoonerSports.com. soonersports.com. Retrieved January 3, 2011. 1 2 3 4 5 Anderson, Kelli (January 26, 2009). Oklahoma forward Blake Griffin is a skilled mimic. Sports Illustrated. Retrieved January 4, 2011. 1 2 3 O'Neil, Dana (August 6, 2009). Griffin's return to Oklahoma has Sooners looking for title. ESPN. Retrieved January 4, 2011. 1 2 Garcia, Marlen (January 26, 2009). Sooners' savior? Blake Griffin guides Oklahoma's title quest. USA Today. Updated 1/26/2009. Retrieved January 3, 2011. ↑ George, Brandon (March 21, 2008). Sooners' Griffin built tough, thanks to folks at home. The Dallas Morning News. Retrieved January 10, 2011. Archived January 16, 2010, at the Wayback Machine. 1 2 SportsNation. Chat with Blake Griffin. ESPN. Retrieved January 4, 2011. ↑ Givony ,Jonathan (May 22, 2009). Blake Griffin:I'm going to work to be a complete player on both ends. draftexpress.com. ↑ Chatmon, Brandon (April 21, 2010). Athletes First boss says Sam Bradford, Blake Griffin stood out even in high school. The Oklahoman (NewsOK.com). Retrieved January 7, 2011. 1 2 Jones, Steven (April 6, 2009). Big Red Royalty: Bradford, Griffin take similar paths to OU. The Oklahoma Daily. Retrieved January 11, 2011. Archived July 15, 2011, at the Wayback Machine. ↑ Blake Griffin on playing other sports growing up. YouTube. Retrieved January 11, 2011. ↑ Ritchie, Heath (March 13, 2004). OCS beats Riverside in thriller for second title in three years. Coaches Aid. Retrieved January 6, 2011. ↑ Farr, Kevin (March 12, 2005). Griffin boys lead OCS to second straight title. Coaches Aid. Retrieved September 12, 2011. ↑ Taylor Griffin – SoonerSports.com. soonersports.com. Retrieved January 6, 2011. Archived November 23, 2010, at the Wayback Machine. 1 2 Helmer, Joey (June 29, 2009). Scout.com: Blake Griffin Timeline. Scout.com. Retrieved January 6, 2011. ↑ YouTube – D.C. Blue Devils vs Athlete's First (Kevin Durant, Ty Lawson & Blake Griffin). YouTube. Retrieved January 7, 2011. ↑ Jenkins, Lee (October 25, 2010). Griffin changing Clippers culture. Sports Illustrated. Retrieved January 7, 2011. ↑ Landsberger, Chris (March 11, 2006). Class 2A finals 3–11–06. NewsOK.com. Retrieved September 9, 2011. ↑ JockBio: Blake Griffin Biography. jockbio.com. Retrieved September 11, 2011. ↑ Farr, Kevin (March 11, 2006). OCS dominates Washington to win third straight gold ball. Coaches Aid. Retrieved September 12, 2011. ↑ Coaches Aid (March 12, 2006). Coaches Aid State Tournament picks. Coaches Aid. Retrieved September 12, 2011. ↑ "Player of the year: Blake Griffin, Oklahoma Christian School – Griffin talking titles for his senior season". The Oklahoman. April 9, 2006. 1 2 Evans, Thayer (March 8, 2009). Blake Griffin Follows His Brother, and Others Follow Him at Oklahoma. The New York Times. Retrieved January 8, 2011. 1 2 Hansen, Scott. Oklahoma: Boys All-State Basketball. MaxPreps.com. Retrieved January 6, 2011. ↑ Plumlee, James (March 10, 2007). 2A Boys Championship. NewsOK.com. Retrieved September 9, 2011. ↑ Blake Griffin. "Blake Griffin Bio". Retrieved January 2, 2011. 1 2 Michael O'Shea (March 23, 2007). "Meet PARADE's 2007 All-America High School Boys Basketball Team". PARADE Magazine. Retrieved January 2, 2011. ↑ Chatmon, Brandon (April 8, 2006). "Player of the Year: Blake Griffin". The Oklahoman. ↑ Jordan Brand All-American Classic. Nike. Retrieved January 12, 2011. ↑ Bailey, Eric (April 2, 2006). "Griffin Dunks To a Title". Tulsa World. Retrieved April 9, 2007. ↑ "Rivals.com Rivals150 2007". Rivals.com. Retrieved January 3, 2011. 1 2 3 "Blake Griffin". Rivals.com and STATS LLC – (c/o Yahoo.com). Retrieved February 15, 2009. ↑ Wright, Scott & John Rohde (January 15, 2008). "Griffin Leaves with Knee Injury". The Oklahoman. 1 2 Swisher, Michael (March 2, 2008). Scout.com: Griffin Out Until Postseason. Scout.com. Retrieved January 7, 2011. ↑ Rohde, John (March 6, 2008). "Sooners Minus Blake Silence Their Critics". The Oklahoman. ↑ Wright, Scott (March 11, 2008). "OU, OSU BASKETBALL: ALL-BIG 12 SELECTIONS – Griffin All-Big 12- Sooner standout also selected on all-freshman team". The Oklahoman. ↑ Associated Press (December 30, 2008). Oklahoma Sooners vs. Arkansas Razorbacks. ESPN. Retrieved January 3, 2011. ↑ Associated Press (November 18, 2008). Davidson Wildcats vs. Oklahoma Sooners. ESPN. Retrieved January 6, 2011. ↑ Player Stats – Blake Griffin – College Basketball – NJ.com. New Jersey On-Line. Retrieved January 3, 2011. ↑ Latzke, Jeff (February 14, 2009). "Blake Griffin has 40 points, 23 boards for No. 2 Sooners against Texas Tech". The Oklahoman. Associated Press. ↑ Associated Press, (February 14, 2009). 'Terminator' helps No. 2 OU crush Texas Tech. NBC Sports. Retrieved January 5, 2011. Archived January 13, 2010, at the Wayback Machine. 1 2 "Griffin day to day with concussion". ESPN. Associated Press. February 22, 2009. Retrieved January 3, 2011. ↑ Helsley, John. "OU loses Blake Griffin, game". The Oklahoman. February 22, 2009. ↑ Associated Press (February 28, 2009). Oklahoma clears Blake Griffin to play against Texas Tech. USA Today. Retrieved January 3, 2011. ↑ "Cowboys Down Sooners In Big 12 Tourney". Retrieved January 3, 2011. ↑ George, Brandon (March 15, 2009). Oklahoma does indeed get a No. 2 seed in the South Region. Sports Illustrated. Retrieved May 8, 2011. Archived January 13, 2010, at the Wayback Machine. ↑ Perloff, Andrew (March 23, 2009). Got it Done Award – Blake Griffin is first winner. Sports Illustrated. Retrieved January 4, 2011. ↑ Katz, Andy (March 24, 2009). NCAA tournament: Close-knit family keeps Blake Griffin grounded. ESPN. Retrieved January 4, 2011. ↑ Tom Weir (March 30, 2009). "Blake Griffin leaves his mark on NCAA tournament". USA TODAY. Retrieved January 3, 2011. ↑ Associated Press (March 31, 2009). Griffin, Hansbrough lead AP first team. ESPN. Retrieved January 3, 2011. ↑ Helsley, John (February 15, 2009). "Blake Griffin has 40 points, 23 boards for No. 2 Sooners against Texas Tech". The Oklahoman. ↑ "Capel's Sooners Still Streaking". Oklahoma Sports / SoonerSports.com (CBS Interactive). Archived from the original on June 19, 2009. Retrieved February 15, 2009. ↑ Big12Sports.com (April 3, 2009). "Blake Griffin, Bill Self Garner Associated Press Honors". Big12Sports.com. Retrieved January 3, 2011. ↑ Big12Sports.com (March 30, 2009). Blake Griffin Wins Oscar Robertson Trophy As USBWA Player of the Year. Big12Sports. Retrieved January 5, 2011. 1 2 Associated Press (April 3, 2009). Griffin first OU player to win AP award. ESPN. Retrieved January 5, 2011. ↑ ESPN.com news services (April 6, 2009). Griffin caps season with Naismith Award. ESPN. Retrieved January 5, 2011. 1 2 Associated Press (April 10, 2009). Griffin, Moore pick up more hardware. ESPN. Retrieved January 5, 2011. ↑ Associated Press (April 7, 2009). OU's Griffin entering NBA draft. ESPN. Retrieved January 3, 2011. ↑ Associated Press (April 8, 2009). Oklahoma's Griffin leads group of players entering NBA draft. USA Today. Retrieved January 3, 2011. ↑ Ford, Chad. "2009 NBA Draft Prospects: Top 100". ESPN. Archived from the original on August 21, 2008. Retrieved August 24, 2008. 1 2 "Clippers lose Griffin to broken kneecap". ESPN. Associated Press. Retrieved October 27, 2009. 1 2 Sheridan, Chris. "Los Angeles Clippers' Blake Griffin to have season ending surgery". ESPN.com. Retrieved January 13, 2010. ↑ Packham, Drew (July 1, 2010).Rookie Rankings: Taking a first look at the 2010–11 class. nba.com. Retrieved January 5, 2011. ↑ Dillman, Lisa (October 27, 2010). "Clippers lose opener to Trail Blazers, 98–88, despite a roaring debut for Blake Griffin – Los Angeles Times". articles.latimes.com. Retrieved October 28, 2010. ↑ Simmons, Rusty (January 10, 2011).Blake Griffin's 'electric' athleticism is shocking. San Francisco Chronicle. Retrieved January 10, 2011. ↑ Moura, Pedro (January 20, 2011). Blake Griffin's double-double run ends. sports.espn.go.com. Retrieved January 23, 2011. ↑ Moura, Pedro (January 17, 2011). Blake Griffin too much for Pacers. ESPN. Retrieved January 18, 2011. ↑ Ziller, Tom (February 3, 2011). Blake Griffin, Pau Gasol Among Those Named NBA All-Star Reserves In West. SB Nation. Retrieved February 3, 2011. ↑ Ziller, Tom (February 3, 2011). Clippers' Griffin ends All-Star drought for rookies. nba.com. Retrieved February 3, 2011. ↑ Griffin, Evans headline selections for 2011 Rookie Challenge. nba.com, February 1, 2011. Retrieved February 1, 2011. ↑ Official Release (January 5, 2011).Griffin, Ibaka, Jennings and McGee set for Sprite Slam Dunk. nba.com. Retrieved January 5, 2011. ↑ Dillman, Lisa (March 23, 2011). Blake Griffin gets first triple-double in Clippers' hard-fought win over Wizards. Los Angeles Times. Retrieved March 24, 2011. ↑ Harris, Beth (April 14, 2011). Clippers beat playoff-bound Grizzlies 110–103. Los Angeles Times. Retrieved April 14, 2011. ↑ Griffin Named Western Conference Rookie of the Month. nba.com. April 14, 2011. Retrieved April 26, 2011. ↑ Harris, Beth (April 14, 2011). Griffin wraps up superb rookie season. SF Gate. Retrieved April 26, 2011. ↑ Official release (May 4, 2011). Clippers' Griffin unanimously voted top NBA rookie. NBA.com. Retrieved May 4, 2011. ↑ Associated Press (May 5, 2011). Blake Griffin unanimously voted top NBA rookie. ESPN. Retrieved May 5, 2011. ↑ Official Release (May 11, 2011). Unanimous pick Griffin leads T-Mobile All-Rookie team roster. NBA.com. Retrieved May 11, 2011. ↑ Immediate Release (February 17, 2012). LOS ANGELES CLIPPERS’ BLAKE GRIFFIN, CLEVELAND CAVALIERS’ KYRIE IRVING ARE FIRST TWO PICKS IN 2012 BBVA RISING STARS CHALLENGE DRAFT. NBA.com. Retrieved February 26, 2012. ↑ "CLIPPERS SIGN BLAKE GRIFFIN TO CONTRACT EXTENSION". NBA.com. 2012-07-10. Retrieved 2012-07-12. ↑ "Thunder's Kevin Durant wins 2013-14 Kia NBA Most Valuable Player Award". NBA. Retrieved May 6, 2014. ↑ "Steve Ballmer Completes Purchase of Los Angeles Clippers". NBA.com (Press release). Turner Sports Interactive, Inc. August 12, 2014. Retrieved December 9, 2014. ↑ Harris, Beth (December 9, 2014). "Clippers beat Suns 121-120 in OT on Griffin's 3". NBA.com. Turner Sports Interactive, Inc. Retrieved December 9, 2014. ↑ "Blake Griffin to have elbow surgery". ESPN. February 8, 2015. Retrieved February 8, 2015. 1 2 Brinkley, Brian (January 26, 2016). "Blake Griffin Breaks Hand Throwing a Punch, Out 4-6 Weeks, Brian Brinkley". KFOR.com. Retrieved January 26, 2016. ↑ Bolch, Ben (January 27, 2016). "Good time turned ugly after teasing for Blake Griffin and Clippers assistant". LATimes.com. Retrieved January 30, 2016. ↑ "Clippers welcome Griffin back with 114-109 win over Wizards". NBA.com. April 3, 2016. Retrieved April 4, 2016. 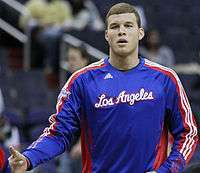 ↑ "QUAD INJURY FORCES GRIFFIN OUT FOR POSTSEASON". NBA.com. April 26, 2016. Retrieved April 26, 2016. ↑ "LA CLIPPERS INJURY UPDATE". NBA.com. April 26, 2016. Retrieved April 26, 2016. ↑ "Griffin's season-high 28 lead Clippers in San Antonio 116-92". ESPN.com. November 5, 2016. Retrieved November 6, 2016. ↑ "Clippers roll past Blazers 111-80, improve to NBA-best 7-1". ESPN.com. November 9, 2016. Retrieved November 10, 2016. ↑ "Griffin scores 25 to help Clippers beat Thunder 110-108". ESPN.com. November 11, 2016. Retrieved November 11, 2016. ↑ "Clippers win 6th straight, 119-105 over Timberwolves". ESPN.com. November 12, 2016. Retrieved November 13, 2016. ↑ "About Blake Griffin". BlakeDunks.net. Retrieved 14 August 2014. 1 2 Mahoney, Rob (January 11, 2011). "Blake Griffin: Playmaker Extraordinaire". The New York Times. ↑ Official Release (December 1, 2010).Knicks' Fields, Clips' Griffin named Rookies of the Month. nba.com. Retrieved January 3, 2011. ↑ Official Release (January 3, 2011).Fields, Griffin win NBA Rookie honors for December. nba.com. Retrieved January 3, 2011. ↑ Official Release (February 1, 2011).Wizards' Wall, Clippers' Griffin named Rookies of the Month. nba.com. Retrieved February 1, 2011. ↑ "Wizards' Wall, Clippers' Griffin named Rookes of the Month". NBA.com. Turner Sports Interactive, Inc. March 1, 2011. Retrieved March 1, 2011. ↑ "Wall, Griffin take Rookie of the Month honors". NBA.com. Turner Sports Interactive, Inc. April 1, 2011. Retrieved April 1, 2011. ↑ "Wall, Griffin named T-Mobile Rookies of the Month". NBA.com. Turner Sports Interactive, Inc. April 14, 2011. Retrieved April 14, 2011. ↑ "Griffin Unanimous AP All-American". SoonerSports.com. March 30, 2009. Archived from the original on June 3, 2009. Retrieved July 7, 2009. ↑ Associated Press (March 23, 2009). OU's Blake Griffin wins Adolph Rupp award. NewsOK.com. Retrieved May 5, 2011. ↑ "Griffin Wins Oscar Robertson Trophy". SoonerSports.com. March 30, 2009. Archived from the original on June 3, 2009. Retrieved July 7, 2009. ↑ Blake Griffin named SI.com Player of the Year. Sports Illustrated. Retrieved on 1 October 2009. ↑ Helsley, John. "Sporting News joins Athlon Sports, FoxSports.com in naming OU's Blake Griffin best player in America". NewsOK.com. Retrieved July 7, 2009. 1 2 Big12Sports.com (March 8, 2009). Phillips 66 All-Big 12 Men's Basketball Awards Announced. big12sports.com. Retrieved on February 7, 2011. ↑ Griffin named Big 12 Player of the Year. Newsok.com. Retrieved on 1 October 2009. ↑ "2007 EA SPORTS Boys All American Team". Rivals.com. Retrieved February 6, 2011. ↑ Olds, Chris (April 11, 2011). Next battle in trading cards: video. ESPN. Retrieved May 6, 2011. ↑ Floyd, Brian (February 25, 2011). Blake Griffin Car Dunk Becomes Kia Commercial. SB Nation. Retrieved April 25, 2011. ↑ McCarthy, Michael (June 21, 2009). "Griffin in line for endorsements with Subway, EA Sports". USA TODAY. Retrieved August 18, 2009. ↑ Casacchia, Chris (April 26, 2011). Vizio Signs Blake Griffin as New Pitchman. Orange County Business Journal. Retrieved May 6, 2011. ↑ "Griffin leaves mark on NCAA". ↑ "NBA Closeup (Blake Griffin)". ↑ "Blake Griffin injures hand in Toronto restaurant fight with team employee". 2016-02-03. Retrieved 2016-02-25. ↑ Associated Press (December 30, 2010). Jefferson leads Jazz comeback win over Clippers. Yahoo! News. Retrieved January 11, 2011. Archived January 2, 2011, at the Wayback Machine. ↑ Dillman, Lisa (May 5, 2011). Blake Griffin donating Kia to benefit charity. Los Angeles Times. Retrieved May 6, 2011. Wikimedia Commons has media related to Blake Griffin.